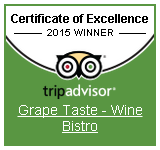 The Grape Taste Restaurant is an upscale, full-service restaurant located in Lake Jackson, Texas that specializes in wine and great food. No need to drive to Houston anymore to find great food when we’re located right in your backyard! Our menu not only offers great food, but also an exciting array of carefully chosen wines to complement your dinner or just have by the glass with a friend. The culinary mastery of our own executive chef will be a treat for your palate, and our atmosphere can enhance a romantic evening or a comfortable night out with friends. Browse through some of our recent pictures to see our newly updated interior as well as some of our premium wines, entrees and events!